In addition to any recs you wish to post at any time, the comm has monthly rec challenges issued by the mods. 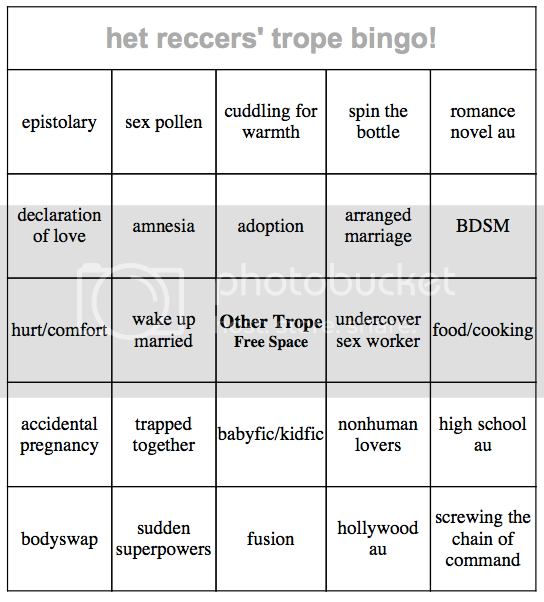 Challenge: To celebrate het-reccers’s anniversary, we’re kicking off a month of TROPE BINGO! 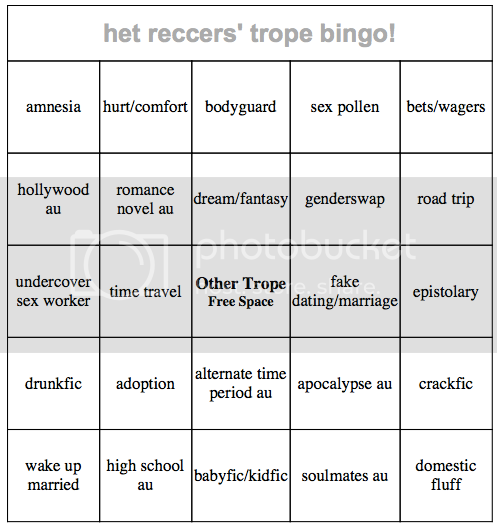 Comment on this post (on LJ) or send us an ask (on Tumblr) to receive your bingo card, then post tropey recs based on your squares—five in a horizontal, vertical, or diagonal row gets you bingo, and each bingo (up to five) gets you an entry into our prize drawing. 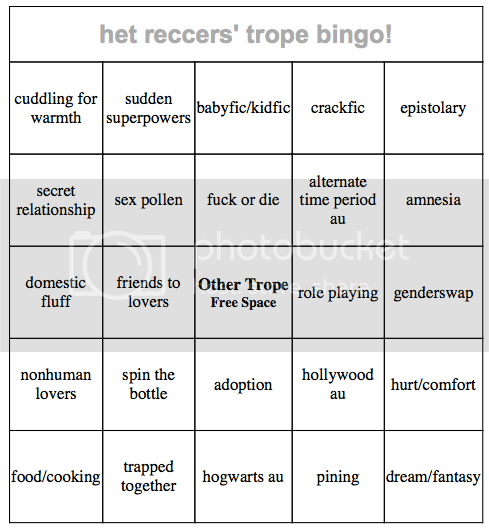 Any and all pairings are welcome; your bingo squares can be from as many or as few fandoms as you like. 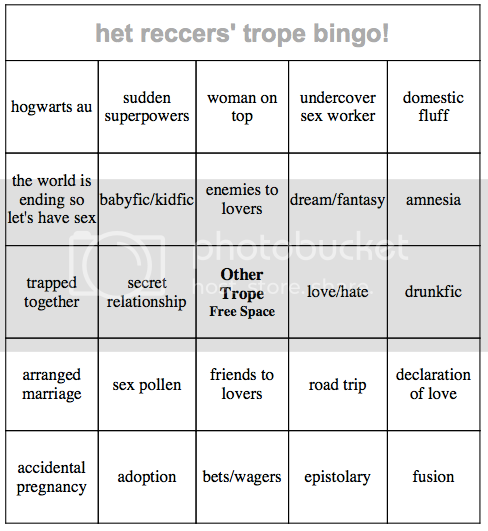 Reccing more than one fic rec per bingo square is allowed (and encouraged! ), and you can complete your bingo row in just one post or a series of them. As always, be sure to check the tags for your fandom and ship and try to avoid reccing any fics that have been previously posted to the comm. 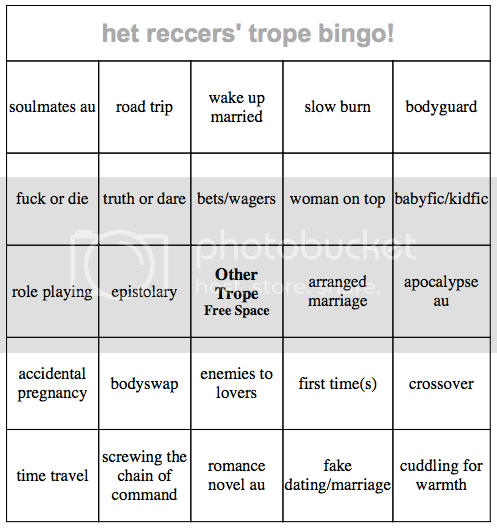 At the end of the month, 5 winners will receive a podfic of their choice, and the whole community will get to enjoy awesome recs with all your favorite fanfiction tropes, from sharing-a-bed to road-tripping to your-OTP-in-the-apocalypse! As always, to post a rec on Tumblr, follow the simple directions on our submit page. To post a rec on LiveJournal, you don’t need to ask for posting rights—just become a community member, copy/paste the text below, and post it as a new entry! *To keep things simple, stories to be podficced must be posted on Archive of Our Own, available in English, no more than 4,000 words in length, and have clear pairings, ratings, and content warnings stated up front. You must also obtain permission from the author to use their work, if it hasn’t already been granted. We’ll do our absolute best to match your request with a reader, but you may want to have a few potential favorites lined up just in case. *To keep things simple, stories to be podficced must be posted on Archive of Our Own, available in English, no more than 4,000 words in length, and have clear pairings, ratings, and content warnings stated up front. You must also obtain permission from the author to use their work, if it hasn't already been granted. We'll do our absolute best to match your request with a reader, but you may want to have a few potential favorites lined up just in case. Aw yeah, let's do this! Oh yes, I'd love one please! Okay, I'll give it a try. I'm certainly reading enough fic. Okay, I want to try, I'm always thinking i need to rec more but then never actually do it. It's gonna be hard with how busy uni is getting (and the fact that I've been reading so much f/f lately) but hopefully I can manage to rec *something*! Oh, sounds like fun! Card please?